Formally acclaimed as the Republic of Rwanda found between central and east Africa, bordered by DR Congo, Burundi, Uganda and Tanzania, it is one of the smallest countries across the African continent. 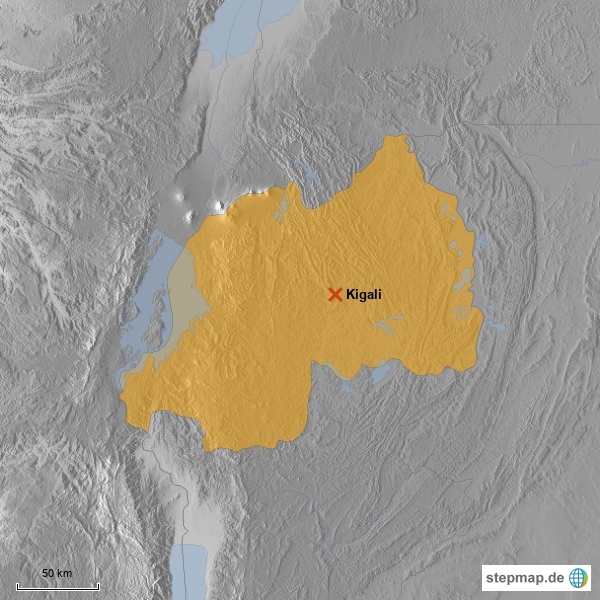 Although Rwanda is a landlocked country, it is part of the African Great Lakes region. This African state brags about its amazing creation of nature and captivating sceneries. The largest and capital city of Rwanda, Kigali is the transportation, economic and cultural center of this African state. This destination is filled with spectacular sceneries which make it one of the most striking capital cities as well as one of the safest places among African nations. Kigali is noticeably clean probably one of the cleanest in the continent because plastic bags are forbidden across the country. Part of the world renowned African Great Lakes, Lake Kivu is sharing borders with DR Congo and Rwanda with most portions of the lake is on DRC. This destination is the largest lake in the country and ranking number six across African nations. Lake Kivu is surrounded by fishing villages, woody hills and the towns around the lake offers an array of activities and adventures. Mountain ranges covering Uganda, DR Congo and Rwanda, Virunga Mountains or Mufumbiro Mountains are comprised of eight dormant volcanoes that are part of the Albertine Rift Mountain and the East Africa Rift. Each country that borders this destination has rainforests and national parks that are home to mountain gorillas. Virunga Mountains may be known as home and place for mountain gorillas, but there are also other wildlife species found within the mountains such as okapi, buffalos and giraffes as well as forest elephants and chimpanzees. If Kigali is said to be the most politically powerfully city, Butare is often tagged as intellectual capital of Rwanda, as huge number of universities are found within the city limits. This destination is where the country’s, or maybe the continent’s, most important national museum is located. Butare was its former and at present being called as Huye, most attractions in the town are the colonial structures related to academic, scientific and cultural aspects. Established in 1934 covering around 1,200 square kilometers, Akagera National Park is located between the borders of Rwanda and Tanzania. This destination is said to be one of the first national parks in Africa and it is divided into three sections, such as the mountains, swamps and savannahs. Akagera National Park is where the largest protected wetland in Central Africa is found, as the Kagera River flows over surrounding lakes including the largest of them, Lake Ihema. The most highly recommended place to visit in Rwanda and the famous habitat of the mountain gorillas, Volcanoes National Park is also one of the best tracking safaris in Africa. This destination is where five of the eight volcanoes that comprises the Virunga Mountains with Karisimbi being the highest among the mountains. Volcanoes National Park is home to various species of gorillas and golden monkeys are also found inside the park. Nyungwe Forest National Park, which is a rainforest found in the southwestern side of Rwanda with towering old trees like ebonies, mahoganies and other sorts, has stunning biodiversity which attracts tourists all over the world. This destination is possibly the most well-preserved montane rainforest in Central and East Africa. Nyungwe Forest National Park is mostly a bird sanctuary with a huge number of butterflies flying around the rainforest that produces a fairytale-like ambiance. Opened to the public in April of 2004 in commemoration of the tenth year of the genocide in Rwanda, Genocide Memorial was built to honor the lives of the Tutsis who passed on in 1994. This destination is a solemn place for the families and relatives of the victims which eventually become one of the historically important places in the country. There are a few more memorials across Rwanda and Kigali Genocide Memorials is being managed by Aegis Trust and the Kigali City Council. Served as one of the refuge center of Tutsis and the neutral Hutus during the eerie genocide in 1994, Nyamata Church is now one of the centers who displays the skulls and bones of the genocide victims. Found in this destination is a mass grave on the basement of the thousands who were killed. Nyamata Church became one of the tourist attractions in Rwanda and the altar still bears a fabric full of blood stains from the victims. Showcasing local talents, Inema Art Center is where contemporary arts are displayed and presented by Rwanda’s finest artists. This destination is filled with different works of art such as paintings, sculptures and other forms. Inema Art Center aims to promote art to the youth and others train interested visitors in creating local handicrafts such as jewelries and accessories as well as leather bags made from goat skin.